Please welcome my guest blogger for today. 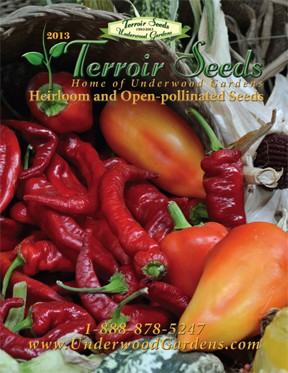 Stephen Scott, a co-owner of Terrior Seeds. Stephen writes a thoughtful and interesting post about planning a garden. Perusing the newest crop of seed catalogs while engaging in some garden planning is a favorite pastime of gardeners everywhere during the cold, short days of winter. It is an excellent way to take your mind off of the often drab and dreary days that separate the last harvest from the first plantings. Seed catalogs can be much more than a pleasant distraction and fodder for summertime daydreams. They can help you with your upcoming garden planning by helping to visualize succession and companion plantings while arranging the palette of colors in the most attractive ways possible. You can get started in one of two ways, with neither being right or wrong. Some prefer to sort through the catalogs first, circling what interests them and what standbys are always planted. Others will use different colors for vegetables, herbs and flowers to make organizing and planning a bit easier. The other approach is to put down an initial plan of the upcoming garden on note or graph paper, using zones or areas to show what types of plants go where. Others will use different colors for different plants to determine where everything will go. These initial plans are easily changed and updated as the planning process moves forward and the new garden starts taking shape. Once the plans is solidified, our Garden Journal is an excellent tool to help keep track of your progress this year. It is free as a download. Remember to try something new each year, while keeping the foundation of what works going in your garden. This way you can experiment with new things and see what works and fits within the framework of what you already have established without risking losing too much if the new variety doesn’t make the grade. If you want to try saving seeds – or you already do – make that part of your plan, where to plant those items for isolation to prevent possible cross-pollination and make the seed saving process as easy as possible. Pay attention to wind patterns and think about how you will isolate them, either through time, distance or exclusion. Time isolation just means planting those varieties you’ll save seed from either earlier or later than others of its type so that blooming and pollination don’t happen happen at the same time. Distance is easy – how far apart are you going to plant? How much space do you have? Can you use the front or back yard on the opposite side from the garden for planting? Exclusion is a physical barrier that keeps everything out including insects, meaning you might have to hand-pollinate that item. While working on garden planning pay attention to the number of days to maturity for a variety and how that will work in your climate. Look at where you are wanting to locate it when reading the size and height descriptions, especially if it needs shade or full sun. Succession and companion planting can make a small or medium sized garden produce like a small scale farm, producing enormous amounts of veggies from a deceptively small space. Think about how much you or your family likes particular veggies, and plan on doing some succession planting this year. Examples of varieties that take well to succession planting are beets, carrots, lettuce, spinach and radishes, but there are others as well. Just give your plants a bit more space to accommodate succession planting alongside companion plants. When deciding on how many plants you’ll need, seed counts are in the variety headings and in each singular variety description, as well as on the website. We are working on getting planting instructions up on the website for each variety, but each packet will have detailed instructions on the back. Look at the colors of your garden and plan a rainbow to grow the aesthetic and nutritional benefits of different colors. Plant a few red, yellow and orange tomatoes with yellow, purple and orange carrots as companions. Use red Chicory with green Kale and rainbow Swiss chard. Pole beans in different colors partner extremely well with corn. Plant some of the vining plants like Red Malabar spinach along the garden fence where it won’t take up space, but give you lots of great tasting heat tolerant spinach substitutes for your summer salads. Melons and squash are happy planted in corners of the garden where they can sprawl along the fence or even over and out without being in the way. Another approach is planting them in containers outside the garden where they have all the room needed and are out of danger of being stepped on. Look at the hot and long season varieties or cold and short season ones on the website for more ideas of what works well for your climate. Use these as a start and experiment to refine into a basis of what, exactly, really works in your garden. This will take time if you are just starting out, but you might be surprised at how much you have figured out if you’ve been growing a bit, even if you haven’t thought about it just this way! Read the descriptions carefully, as we’ve worked hard to try and get good information into them to help you. Flowers are an often overlooked, but essential component of any serious vegetable and food garden. They don’t just belong in the realm of the flower or landscape gardener! Flowers attract pollinators (not just bees) that greatly improve production in the garden; are nursemaid plants for smaller, more tender ones; are core ingredients for some incredible teas and bring a delightful aroma that soothes and grounds you. Our flowers are notated by Annual, Perennial, Biennial which depends a lot on climate zones but will allow you to do some accurate planning for where they fit in best. Some of the best ways to get started using more flowers in and around your garden is with one of our mixes, especially created for drylands, humid climates or to spread some serious fragrance in your garden. You should have some good ideas starting about your garden this year. Spending some time during the colder times in planning will help you to create a masterpiece that will grow some incredibly tasty treats to enjoy with your family and share with some lucky friends and neighbors.